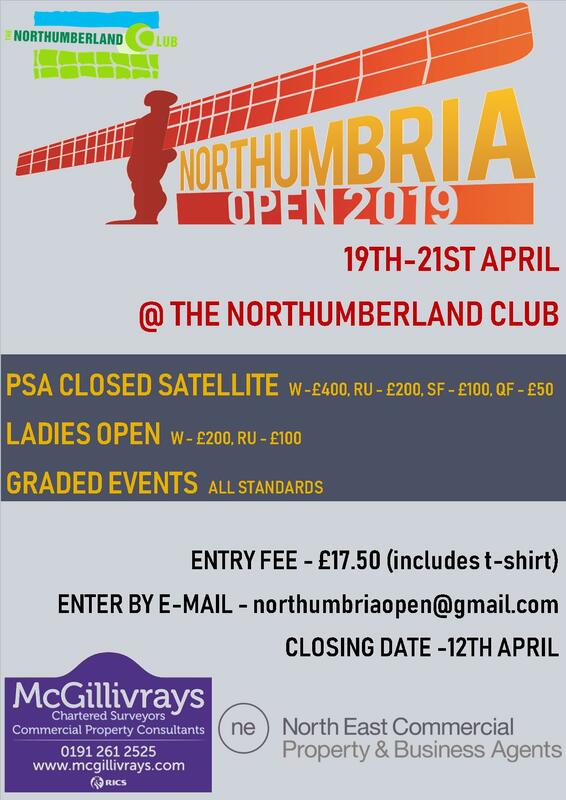 Players of all ages will be competing for the county titles this weekend as Tynemouth Squash Club is all set to host the 2014 Northumbria County Closed. In the Mens A event top seed Dave Barnett will be looking to add another title to his collection, but second seed Liam Gutcher might have different ideas, trying to claim his first county title. 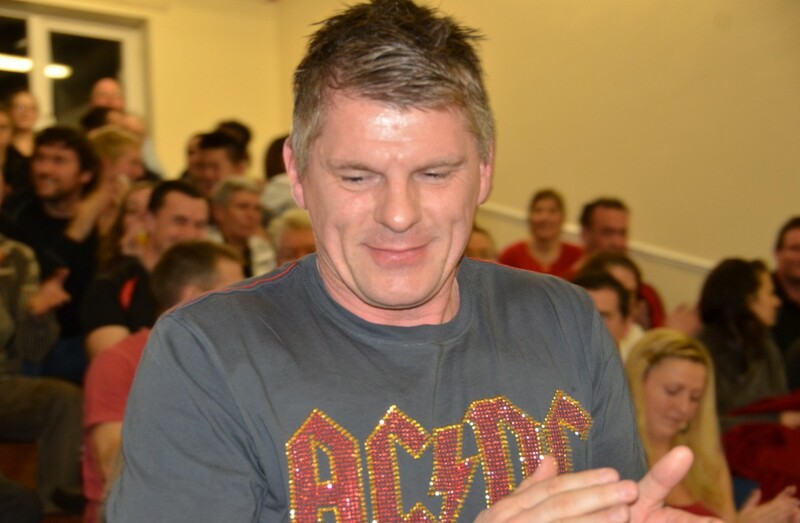 3/4 seed and one of the crowd’s favourites Paul Lord will also be fighting his way to try and reach the final after having to pull out injured in last years semi final. The Ladies event will see top seed and last year’s runner up Sam Ward looking to get her name back on the county trophy. 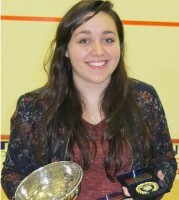 Her main competition will be second seed Emma Gregson (Barnett) and 3/4 seeds Maria Bainbridge and Hannah Cliff. Last years Ladies County Champion Lucy Beecroft is unable to compete to retain her title as she is out with injury, hopefully she’ll be back to full fitness soon! The Mens B event is full of junior talent this year with Northern’s Alex Robertson and Michael Mattimore heading the competition. Tynemouth’s Sean Millington looks to be in good form and will be strong competition for the top seeds. Some older faces like Peter Fargher and Eric Mok will also be fighting the battle in this event alongside the juniors. The Mens C event welcomes cameraman and top seed Steve Cubbins who will be trying to get his hands on some county silverware! Brothers Max and Angus Forster will also be looking to get some good games in the event and maybes do some damage! With the legend Brian Beeson not in the Mens O45 event this year top seed Glenn Ward, who pulled off a miraculous win over Beeson last year, will be looking to retain his title! The most prestigious title as Glenn would say! Second seed Russell Hunter will be tough competition for the magician and will hope to work some magic of his own if the top seeds both reach the final. The Ladies O40 event will be the battle of the Tynemouth Ladies 1st and 2nd teams and also the battle of the injuries! Top seed Sue Beecroft will look to get her hands on the title but second seed Louise Robertson, aka The Mackem, will be tough competition for the top seed. Hopefully the players in this event won’t finish the tournament with more injuries than they start out with! The brand new and exciting doubles event is very popular this year with 14 pairs competing. I’m sure it’ll be very crazy and jaw clenching stuff as doubles always is! There will also be the Men’s C & D and O55 events taking place over the weekend. That’s all the previews for the events taking place over the weekend; all matches on court 5 will also be streamed online so you can watch the biggest tournament of the year wherever you are!! 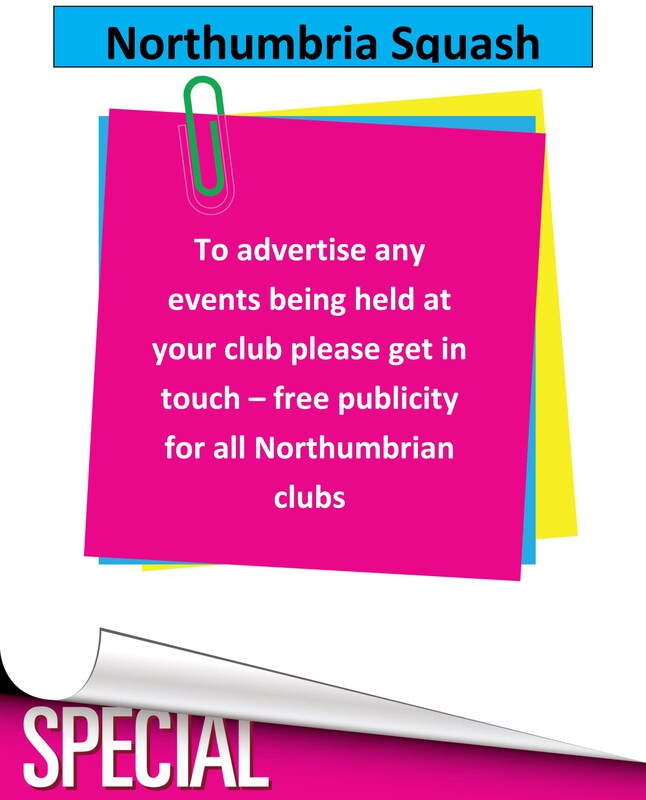 All in all it should be a great weekend at Tynemouth squash club, as the cream of Northumbria squash battle it out, good luck to everyone participating! 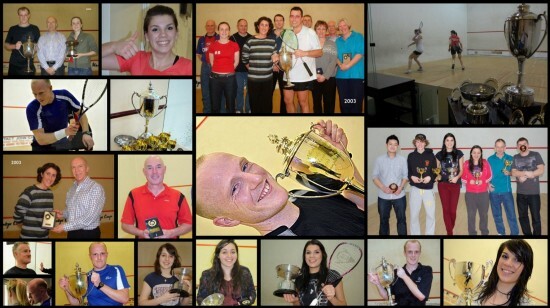 This weekend, the squash world holds its serve as Tynemouth squash club hosts the scramble for trophies we like to call The 2014 County Closed. It’s a hugely anticipated event across the region, as squash players of all ages dig out their old resin pads and racket covers in the search for at least a place in a Plate final. Can Dave Barnet claim his 58th Senior title in a row or can one of the younger guns like Gutch or Hardy steal it away for him? One thing’s for sure, we’re not sure. It’s also great to see the new crop of juniors in the Main Event – Jamie ‘The Splits’ Todd… Chris The Wiggins, now 7ft 6 and playing professional basketball for the Alnwick Globetrotters. Even Dan Ward has made the trip down from Edinburgh – he set off last Thursday as he’s walking down. And there’s also the return of the wanderer James Wilson from Peterborough, where he works in a skip. All in all a great event, 25% off all matches if you get there early. Can Sam Ward add to her previous titles cruelly stolen by me last year? Or can Emma Gregson (Barnet) or one of the juniors sneak in and take it? Nobody knows at this stage cause it hasn’t been played yet – this is just a preview. Either way it’ll be exciting, 2 for 1 before 9pm. Can the high flying Michael Mattimore, now age 3 and a half, claim a full County title so young, or will he have too much homework ? Can Erik Mok stop changing the draw and manage to play his games? Has Peter Farghar ran out of sliced drop shots? These are the questions no one is asking, but will be answered anyway. Free let with every game marked. Steve Cubbins finally gets the No. 1 seeding he’s craved for years. But there’s people out to get him – Martin Bone, Angus Forster – all want a piece of the No. 1’s scalp. But will Scubbs illegal lob serve give him the win? We don’t know, but it will be interesting to watch if there’s nothing on the telly. Free crisps with every correct score called. Top seed Ryan Beattie is the man to beat – that’s why he’s top seed, you see. But who can do it? Pringle? Varrall? Maybe, but if they do, they’ll have to be on top of their game as Ryan has been practicing all night, every night for the past 3 months. That’s how serious he is. He is Ryan. The UnBeattiable. These games are only available in 3D. No Beeson this year, so why even bother mentioning this event? Well, there’s still Ward, Hunter, Hedley, Campbell – so that’s why not. It’ll be a hard fought event tho, let’s hope the winner can still walk down the stairs for his trophy. Backhand shots count double in this event. All entrants are from Tynemouth, as apparently, no other clubs have any ladies over 40. That’s because Tynemouth have a system where they preserve their ladies in pickled onions in between matches, so they’re still going strong. Sue B, Dawn W, Nicky D, Louise R are all there – maybe next year they’ll have full surnames rather than just initials. Will be a great event. Viewing only allowed via sideways glances. Ronnie Freeman heads the field here in his birdman outfit, with the likes of John Thompson, Scubbins and Colon McNestrie all making the Horlicks for supper. Matches are the best of 1 point or sudden miss. A good entry for this age group, coz they were told they’d get a bedtime story and tucked in if they won. These matches are vegetarian friendly. For the 1st time there is a County doubles tournament! This should be a lot of fun, with lots of jumping over the ball, getting in the way and general doublesiness. 2 groups of 6 pairs will make for a long round robin 1st round on Saturday, so bring a book in case you get bored. One ball per match, maximum of 4 serves per attempt, random scoring, I max. All in all it should be a great weekend at Tynemouth squash club, as the cream of Northumbria squash battle it out! Top seeding I’ve craved for years ??? In my own world I’m the defending ‘C’ Champion, having won it two years ago (15 years after I won it for the first time) and then been denied the opportunity to defend with the scandalous “one competition only” rule last year, when I was shafted by getting the Birdman in the first round of the 55s, just like I was shafted 24 years ago when the County vets was delayed so that the birdman became old enough for the 35s and I got him then too. Bitter and twisted, who, me ??? Entertaining as always Bobby and well done Lucy. Hoping to enjoy Tynemouth’s hospitality over the weekend ( coaching commitments permitting ) but good luck to everyone taking part…especially all the juniors! !